It is the mid-1960s in a small seaside town in Croatia. Two children, Luka and Dora, meet on their first day of kindergarten. Luka faints the first time he sees Dora and she wakes him with a kiss. The two become inseparable. Over the next few years, they wander the shores of their town, lying on their special rock by the sea as Luka paints until Dora's parents move to Paris. Bereft, Luka becomes a solitary young man, prey to the needs of his family, but a promising painter. In Paris, Dora blossoms and becomes a successful actress. When Luka comes to Paris for a show of his paintings, a chance encounter brings them together. Now adults, they fall back in love, and their feelings are given resonance by a shared adoration of Pablo Neruda. Timing and fate, however, seem determined to keep them apart. 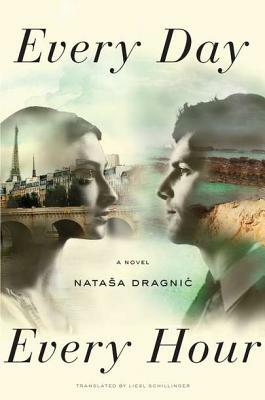 Like "The Solitude of Prime Numbers" and "One Day," Nata a Dragnic's "Every Day, Every Hour" is a haunting tale of star-crossed love that will utterly entrance readers with the rhythmic beauty of its language and ineffable air of expectation and heartache. Nata a Dragnic was born in Split, Croatia. After studying German, English, and French, she attended the Croatian School of Diplomacy. She currently lives in Erlangen, Germany. This is her first novel.Liesl schillinger is a New York based journalist and literary critic who writes regularly for "The New York Times Book Review." She was on the editorial staff of "The New Yorker.""